“Healthy Christmas Gifts” Give-a-Way Series on Facebook Next Week! Happy Wednesday! If you have been following my posts on Facebook, you know that I have recently partnered with Under Armour to help them with their end-of-year campaign. I am very excited about this because it means I get to do some reviews and give YOU some great products! 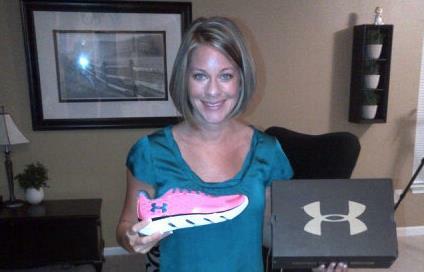 Under Armour running shoes for the give-a-way series next week! BUT, it gets even better! I have partnered with other Sweat Pink and FitFluential Ambassadors to bring you an awesome “Health Christmas Gifts” Give-a-Way Series on Facebook next week! There are 10 of us fitness professionals and/or bloggers giving away great products! The products range anywhere from the Under Armour running shoes or Under Armour sports bra to workout shirts and running/cycling arm warmers. So stay tuned for more details and instructions on how to enter the give-a-ways. Be sure to like my Fit Pregnancy and Parenting page on Facebook and like the other girls pages that I introduce throughout the week. You will need to like the pages to be eligible for the drawings. Here is a preview of some of the pages that will be featuring give-a-ways. I will list all of the give-a-ways on my Facebook page next week as well. Running with Sass will be giving away an Under Armour sports bra; Mommy Run Fast will be giving away an awesome Under Armour sweatshirt, and there are 8 more opportunities for YOU to win awesome healthy Christmas gifts for your family, friends, or to keep for yourself! Sounds awesome! Love that you guys are all partnering together to have a huge giveaway 🙂 Under Armour is the best! Thanks girl! We are excited! I think it will be very fun and great for our readers. excited to see what is going on with this business. to keep weight where needs to be during holidays I am watching my sugar intake, considering elimating it all together b/c I think it maybe be adding to eating issues. Amanda you are the best!